In its original incarnation, 914Eats! was going to be entitled Deserted Island Food. It was basically the food you would choose as your only meal, every day, forever if stranded on a deserted island. If I were ever in such a predicament, no hope for rescue and nothing but a volleyball for a friend, my choice would be simple: hamburgers. So this post will be about three of the best burgers in Westchester. If I may wax poetic for a moment (or at least as poetic as someone whose favorite poet is Dr. Seuss can), is there a more perfect food than the classic hamburger? A hamburger’s perfection is the sum total of many parts, not all of them actual food. A soft, fluffy bun giving way to a juicy, beefy patty whose charred, crusty exterior yields to crumbly, soft meat so juicy that you immediately feel it dribbling down your chin. A pickle, perhaps, to add a little vinegar to cut the rich, fatty flavor, some ketchup for sweetness and maybe a leaf of lettuce for crispness. Simple, delicious, perfect. But, as I said, it doesn’t stop with the physical sandwich. A burger is transporting. A burger picks you up and hurls you back in time to some of the best times in your life. Burgers are summers, childhood summers when the sun set late and the only thing calling you away from games and fun was the smell of meat, faintly tinged with dad’s impatiently sprayed lighter fluid, grilling over briquettes. Burgers are purely satisfying. If they weren’t, there would be no glut of new chains inspiring legions of fans to keep returning and attesting to their greatness. Nor would there be blog after blog after blog covering nothing but the joys of the burger. As this is entitled 914Eats!, we will obviously localize our discussion to our beloved county’s offerings, and, as the theme of this humble column is iconic Westchester foods, we will obviously now discuss The Piper’s Kilt. I could waste a few hundred words describing what The Piper’s Kilt is (believe me, I can waste words like a sailor on shore leave wastes money), but, if you’ve lived in Westchester for any length of time, you already know. Located at 434 White Plains Road in Eastchester, Piper’s Kilt is a pub that just happens to feature what is generally regarded as the best burger in Westchester, if not anywhere. Side note, I think only residents of Westchester know there is an Eastchester….moving on……As with any food called “the best”, especially one as universally loved as the hamburger, there are also those who deride The Kilt’s burgers as overrated. That said, those voices are in the minority. The Kilt’s is a classic pub burger, 1/2 lb. of juicy ground beef (unless you go for the 10 oz. Broadway Burger, below) that is griddled to perfection. So what is it about the Piper’s Kilt burger that sets it apart, that inspires the word “best” to be bandied about year in and year out? That question is answered upon a first bite. The burgers are juicy. Dripping down your chin and arms juicy, but not at all greasy. 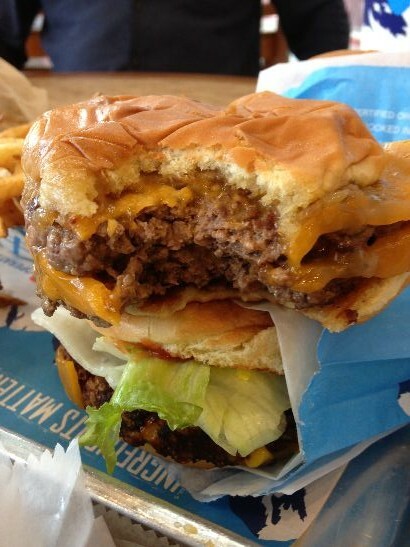 The bun is large enough to hold up the substantial patty but not so large as to overwhelm it. The nicely charred patty is also big enough that toppings accentuate the burgers rather than taking it over. The Eastchester, my favorite, includes bacon and cheese and comes with a side of chili. Surprisingly good chili as a matter of fact. On weekends you see families there, many of the kids in Little League uniforms harkening back to my earlier example of the burger as a part of childhood memories. It was good to see another generation having the burger’s place…..seared into memory. Speaking of next generations, let us now move on to the next generation of classic burgers in Westchester. After all, as I said earlier, everyone in Westchester already knows about Piper’s Kilt! What’s next? The next trend, the next classic? In my grueling search (pity me?) I isolated two burgers that, for very different reasons, will stand the test of time and ingrain themselves upon the culinary fabric of our county. The 411 on Piper’s Kilt. 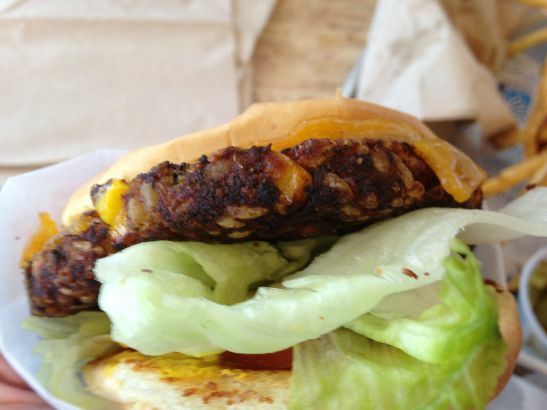 Local franchise owner Dan Magnus, a former media executive, said the fact that he and his wife were raising their children on organic food made the decision to open Elevation Burger a natural. In fact, he relayed the fact that a patron at his Rye Brook location stopped him to thank him for opening because she could now give her kids the food they love without feeling like an irresponsible parent. This is because their organic beef boasts more nutrients and lower calories and saturated fat. Which is all nice. I appreciate the effort, but this is not a list of best global citizens or civic duty after all, it is a list of best burgers. 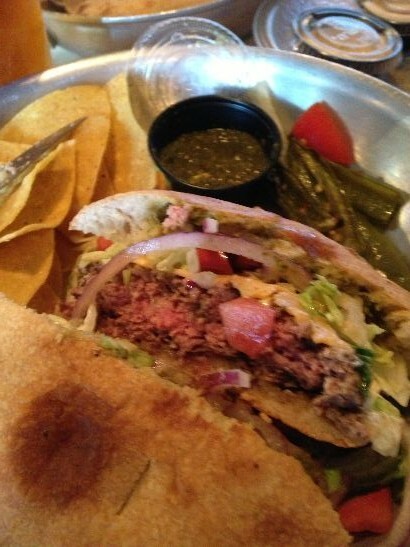 I am happy to report that Elevation’s use of USDA-certified organic, grass fed beef has, in fact, elevated the burger. The moment you bite into one you taste a difference in flavor. Many haute burgers use blends of different types of beef, as does Elevation, but the real difference seems to be due to the grass fed, free range beef. 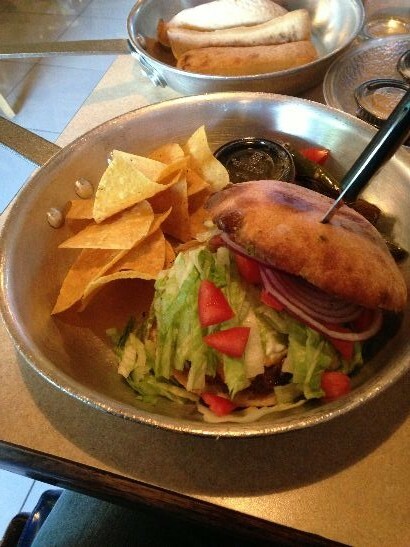 It yields a clean, beefy flavor that, despite an extensive list of available toppings, can truly stand on its own. The fact that the beef is ground on premises leads to a fantastic texture as the meat isn’t overly packed and dense, just crumbly, juicy, beefy perfection. I mentioned the extensive toppings, but they are impressive as well as extensive. No “cheese product” on this burger, but 6 month aged cheddar which further heightens the enjoyment. The bacon is organic as well, the quality and flavor also outstanding. As a burger aficionado the very idea of a Veggie Burger is borderline blasphemous, however I must give a nod to Elevation’s which had visible vegetables and an enjoyable flavor. I know this is not the most detailed description, but I’m taking time to praise a Veggie Burger, read between the lines! Though Elevation takes pride in its use of “100% Heart-Healthy Olive Oil” for its French fries, I admit I was a bit skeptical. Olive oil has a lower smoking point than canola or peanut oil and I just wasn’t sure how crispy they could be. I am happy to report me fears were unfounded. 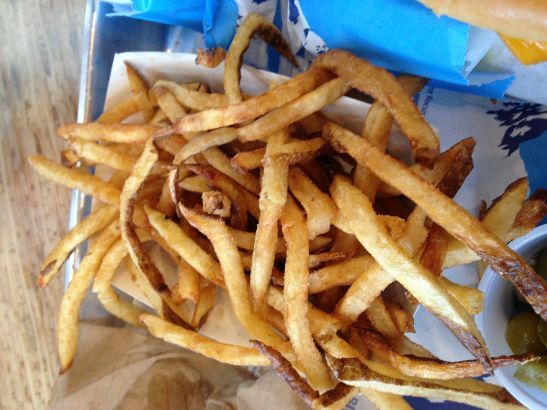 They were all you could want from an order of fries. Crispy exterior, fluffy interior and beautifully salted. All that and healthier to boot! 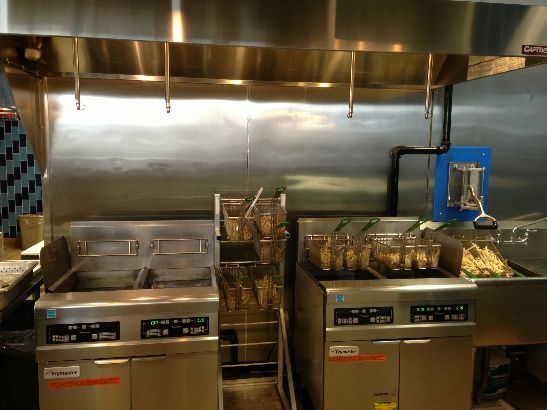 I should also note that the frying station was impossibly clean. The gleaming fryers looked like they’d never been used even though I was there right at the tail end of lunch time. Elevation also offers an array of shakes and malts. There is no pretension that these are healthier than other malt options, but they are delicious. And with all the calories and fat you just saved in choosing Elevation over other fast food options, don’t you deserve it? 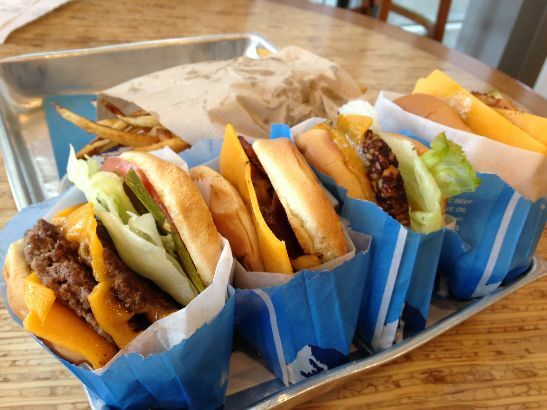 In its dedication to quality Elevation Burger has produced a recipe for success that should allow it to thrive nationally and to become a classic burger offering locally. 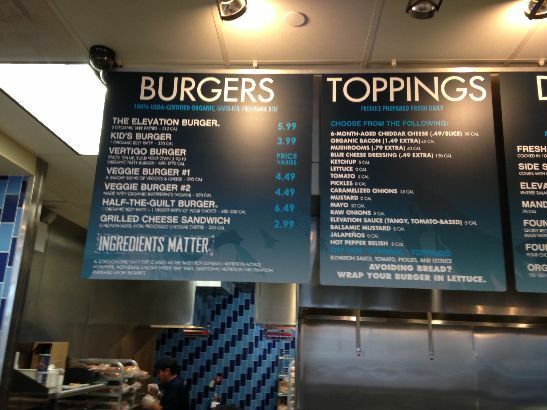 The 411 on Elevation Burger, Rye Brook; The 411 on Elevation, Yonkers. Owner Alan J. Cohen (AJ), a lifelong resident of New Rochelle, likes to call AJ’s a “chef-driven burger joint.” In fact, burgers aren’t the only thing on the menu. It offers an array of BBQ, pizza and Italian dishes including Mo’s Favorite Lobster and Shrimp Positano, named for a cerain legendary Yankee future Hall of Famer. The eclectic menu almost made me skip AJ’s in my search for future classic burgers. Fairly or not, consciously or not, I attributed the “Jack of all trades, master of none” idea to it. Thankfully a very smart friend, and fellow Small Bites blogger, changed my mind. AJ’s patties are hand formed from a proprietary blend and charcoal grilled. The resulting burger is everything it should be. Perfectly cooked it has a charred exterior and soft, pink, juicy interior. While some high end burger joints experiment repeatedly and search high and low for the perfect bun, AJ’s uses Martin’s potato rolls because Alan found that that was the bun most people liked best. 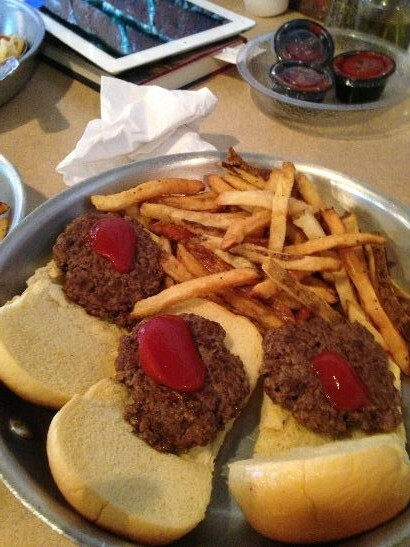 His sliders are served in the fashion of White Manna Hambugers, the legendary burger joint in Hackensack, NJ. They are cooked on a flat grill and served with grilled onions. If that was all there was to AJ’s it would still be pretty great. 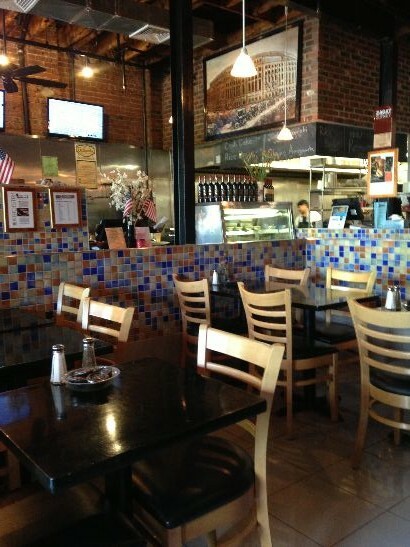 But AJ’s, a pleasantly decorated, well staffed restaurant is much more. 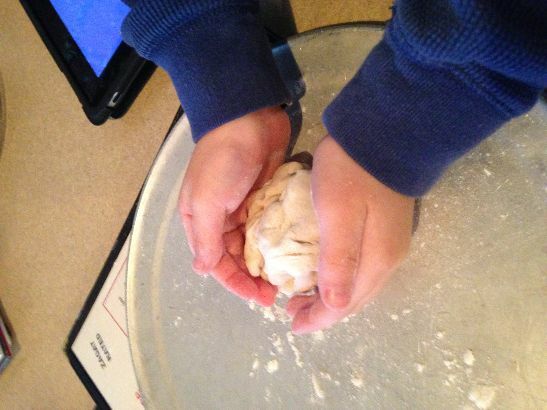 Upon being seated my kids were offered pizza dough to play with, roll and shape which was then baked and presented to them before leaving. So much better than a few crayons and a connect the dots menu! This is a nice way to establish itself as a family establishment, but, this being about burgers, let’s get back on point. The “chef driven” part is where AJ’s really ups the burger ante. It’s specialty burgers have won the New York Beef Council’s Best Burger award the last two years running. As I stated earlier, I generally enjoy my burgers fairly simple, no need to overwhelm perfection. However, as a devout lover of all things spicy, I just had to try the 2013 award winning Habanero Cheddar Burger. Featuring lettuce, tomato, onion, a spicy five pepper sauce and “crema for relief”, this burger is served on a winning garlic roll. It was perfectly sized offering the proper ratio of bun to beef. The crust was crisp but yielded easily to a fluffy center, saving the burger, already heaped with toppings, from falling apart in my hands. Though heaped with toppings the flavor profile was not muddled, nor was the burger itself lost in the shuffle. Everything worked to compliment what happened to be an outstanding burger patty which was perfectly cooked. I’d intended to only have a few bites as I had previously made dinner plans. That plan did not work out very well. At all. The burger was just too addictive to leave any part uneaten. In his creativity and impressive technique, Alan Cohen, and AJ’s Burgers is presently one of the best burgers in Westchester and destined to be a county icon! 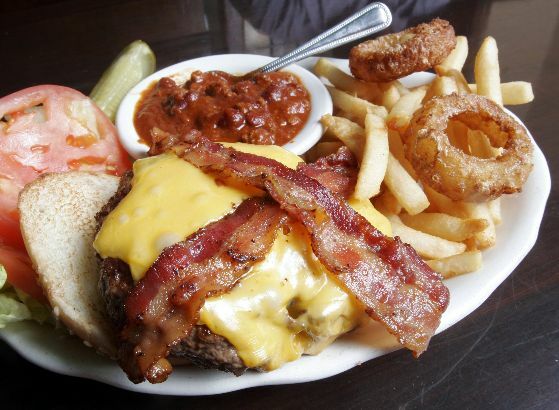 OK, we know we’re gonna hear it: What are your three best burgers in Westchester? I love Piper’s Kilt Yankee Burger but the best burger I’ve had in Westchester County is in here in Chappaqua at Jardin du Roi (the du Roi with fried egg and bacon is sublime). I also love Michael’s in Pleasantville. The Garth Road Inn also has an amazing burger, always cooked to perfection. A nice selection of draft beers helps make it taste all the better. Try their Irish Bangers, too! As far as Chains go, Smashburger in Mamaroneck also serves a very tasty burger and great fries. Service is great, food is always hot. All you need is salt & pepper, and lots of napkins. If you don’t time the first bite correctly, you’ll have juice all over your plate! Brunch burger at Growler’s Beer Bistro or at Craftsman Ale House. Plus a great selection of craft beers to wash it down. The best burgers in Westchester are at POW! Burger on the Post Road in New Rochelle, not too far from the Larchmont border. They start with a round ball of meat and smash it down on the grill. The burgers are juicy and delicious. Great fries and shakes too. That’s pretty much all they serve, except I think they have hot dogs on the menu too. Totally worth the trip. They are our family’s favorite by far and we’ve tried them all. I been too all of them!